If you're a Christmas Enthusiast, you take a lot of pride in your holiday displays. You go through a lot of work to put them up every year, and endure no small expense in buying and maintaining them. And while you certainly enjoy the breathtaking beauty of your Christmas light displays, you get even more satisfaction from the joy that they bring to others: your kids, neighbors, and even wayfaring strangers sightseeing through your neighborhood, attracted by the visual feast so generously provided by yourself and others. All that work and expense to create a masterpiece of holiday beauty, and all for naught because you (or someone) forgets to flip a switch! Or maybe you're not home when the lights should be turned on. Whatever the reason, if your lights aren't on when they should be, what a waste! And speaking of waste - how about all those times when your lights are burning at 3 a.m., sucking up expensive electricity with not a soul in sight? Remember the old philosophical question: "If a tree falls in a forest and nobody is there to hear it, does it make a sound?" Here's a variation for Christmas Enthusiasts: "If your Christmas lights are burning in the wee hours when nobody's looking at them, are they still using electricity?" Yes, it's a silly question - the answer is printed in black and white on your utility bill! Turning lights on, and turning them off - a simple job. A mere flip of a switch. But somebody's got to remember to flip that switch, and at the right times, both on and off. Otherwise, there's a price to be paid. If you're still turning your lights on and off manually (when you don't forget! ), why not let a bit of high-tech gadgetry handle that chore for you? Hook your lights up to an electric timer, and set and forget. Your lights will be turned on AND off like clockwork, exactly when you want. We offer several models of Christmas light timers. All are quite inexpensive and extremely reliable. 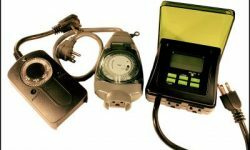 Our timers come in one of two categories: photocell and standard. Photocell timers are the more popular, and in most cases, the more convenient. Photocell. Photocell timers are equipped with a light-gathering device that enables them to distinguish daylight from dark. Most photocell timers have multiple settings. The most common are: always on, dusk to dawn, 2 hours, 4 hours, 6 hours or 8 hours.With a photocell timer, you can be sure that your lights will never be burning futilely in broad daylight, like a water sprinkler running full-blast in a raging rainstorm. One note of caution if you're considering a photocell timer: If you live in an area with lots of ambient light at night, a photocell timer may not work for you. The elevated levels of nighttime light might fool the timer into 'thinking' it's still daylight long after the sun has set. Standard. A standard timer triggers on-off sequences based upon an internal clock. You'll set the time on the internal clock, and program in your on-off sequences. A standard timer isn't quite as convenient as a photocell timer, because it relies upon the user programming both the internal clock and the on-off sequences. Another disadvantage with standard timers is that if the outlet loses power, such as the GFI trips, the timer will have to be set again once the GFI is reset. Standard timers are available with digital touch pad controls or analog rotary dial controls. Some timers come with multiple outlets, giving you the flexibility of plugging in multiple strings of light. That's a great convenience, but you should take care not to exceed the maximum wattage rating of the timer. 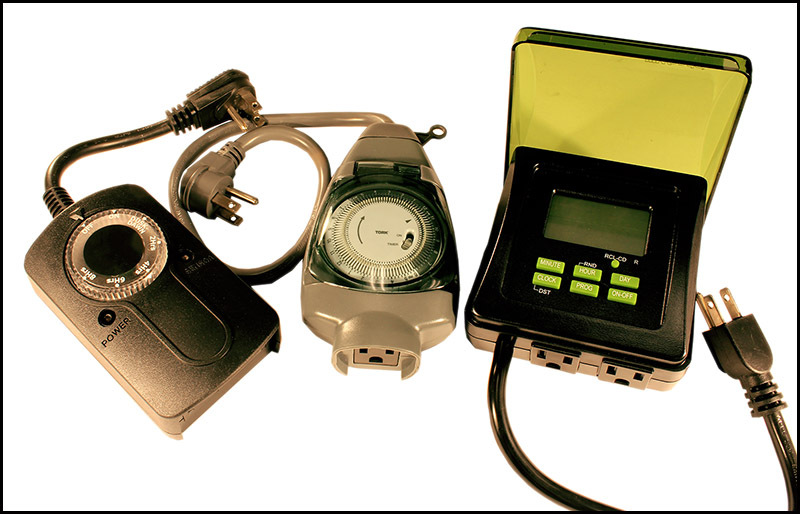 You can easily measure the wattage requirements of each string with a Kill A Watt Electric Usage Monitor. This handy product will measure the amount of power used by each cord that you'll be plugging into your timer. If the total doesn't exceed the maximum rating of the timer, you're good. Otherwise, you may need to distribute the load among two or more timers. And you'll be wise to use only heavy-duty timers that are UL labeled for outdoor use, and that are rated at 15 amps (1800 watts). While 8 amp timers may be cheaper, they aren't likely to hold up as well as 15 amp timers. It's a simple job - turning lights on, and then turning them off again. But given our forgetful nature, it's a job that we humans aren't all that good at. Automatic timers are simple, inexpensive devices that handle that one job with extreme reliability. It's what they're good at. Why not let them handle it?